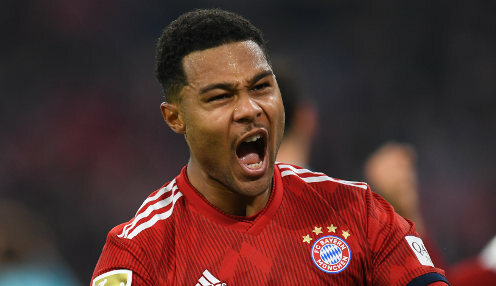 Versatile forward Serge Gnabry is hoping to enjoy plenty of success in the future after extending his Bayern Munich contract until the summer of 2023. The 23-year-old Germany international joined Bayern in the summer of 2017 from Werder Bremen, but spent the whole of the following season on loan with Hoffenheim. Of course I hope for many titles and great moments and I'm looking forward to a good future with FC Bayern. However, Gnabry has been a regular in the Bayern set-up this season, scoring eight goals in 29 appearances in all competitions and his reward is a three-year extension to his current deal. Gnabry told his club's official website: "I'm feeling very, very much at home here. It's great fun to play for this team. "Of course I hope for many titles and great moments and I'm looking forward to a good future with FC Bayern. "In terms of football things are going very well for me at the moment, but I know I still have room for improvement and that I'll have to continue to get better." Gnabry has scored four goals in five outings for the German national team to date, completing a hat-trick in an 8-0 World Cup qualifier against San Marino in November 2016. Meanwhile, Bayern are priced at 1/6 to win the Bundesliga title this season, with Borussia Dortmund available at 4/1. The Munich outfit have pulled level on points with BVB after the Die Schwarzgelben won just one of their last five league games.